A limited-edition fragrance that highlights the soft, luxurious florals of the Eternity signature scent. 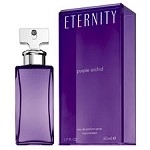 Eternity Purple Orchid captures the spirit of lasting passion - a love in full bloom. Notes: Waterlily, Dewey Green, Italian Mandarin, Purple Vanilla Orchid, Purple Plum, Freesia, White Peach, Rose, Tonka Bean, Indian Sandalwood, Heliotrope.